Note: We will be initiating the 2019-20 program in October, 2019 . For more information about the upcoming schedule of meetings and general background information, please contact Megan Williams, mwilliams@adl.org. Recognizing the need to build the next generation of advocates, this program provides a forum to educate young leaders about ADL and contemporary issues relating to the Jewish people and Israel. GLI is a tool to help build the next generation of ADL leaders by providing these promising young adults with leadership skills and an understanding of building community in the U.S. The Glass Leadership Institute has been a program of the regional office since 1998. Annual participants are asked to complete an application and commit to a 9 month program of learning and interaction. The fee is a tax-deductible $250 that can be paid over the 9 month session. 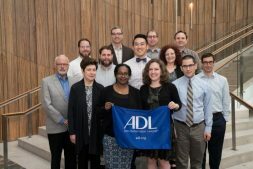 Between October and June , through monthly meetings, participants are introduced to the history and mission of ADL and the major challenges facing the organization and its constituency. Specific sessions focus on ADL’s domestic and international agenda, with topics ranging from hate crimes legislation to anti-bias learning to interfaith relationships to Israel and the Middle East. The program includes a subsidized trip to ADL’s National Leadership Summit in Washington DC in June 2019 at the Grand Hyatt Hotel. Following their year of participation in Glass, graduates have an opportunity to become Staenberg Fellows. Endowed by the Staenberg Family Foundation, the Fellows program provides continuing opportunities for discussion, interaction and networking for the next generation of Jewish community advocates.